Maybe the only unknown link on the defense going into fall camp is the linebacker position. It's not that Michigan doesn't have depth, and quality depth, but is the system tailored to their strengths? Shafer likes to blitz. He likes to create confusion for the offense by constantly adapting his formations to create different looks. The linebacker is a huge part of that scheme. There are technically 3 main starters at linebacker on the depth chart. But with how much they will be blitzing and flying around the field, you may see as many as 6 in a consistent rotation. Senior linebacker Austin Panter (6-3, 231) will be lining up early and often. Listed as a starter on the early depth chart, Panter saw action in 7 games last year and totaled 7 tackles (1 for loss). He's a 2007 All-Academic Big Ten selection. Also listed as a starter, Merell Evans (So. 6-3, 231), earned his first letter in 2007. Saw pretty much just special teams action in 07. Not sure how or why he's listed as a starter for 08. We'll be the judge. Obi Ezeh (So. 6-2, 247) is a returning starter at the middle LB position. He's the top returning tackler with 68 tackles, four tackles for loss, two sacks, one interception, three pass breakups and forced one fumble. Started 10 games and saw action in all 13 last year. He was a 2007 freshman All-American. Also in the mix will be 5th-year senior John Thompson (6-1, 239). Thompson saw action in 8 games last year, starting 3. Made 29 tackles in 07, also two tackles for loss, one fumble recovery, one interception and one pass breakup. He's a three-year letterman having played in 33 contest and recording 54 tackles in his career. A couple other names to keep in mind, Jonas Mouton (So. 6-2, 230) and Brandon Herron (Fr. 6-2, 218). Like I said, it could end up being a revolving door of players at LB as the season progresses. The key obviously is that we're young. Michigan has never really had big name LBs in the past. And it's likely that this core group won't stand out too much either. 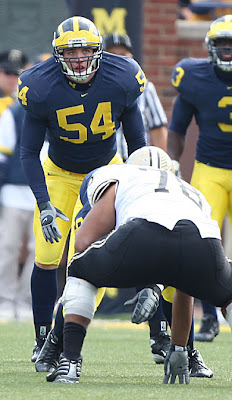 I don't mean to sound like I am bashing the guys we have, but by-in-large, Michigan is not Linebacker U. Of course, much of that stigma comes from years and years of the same defensive philosophies. We've had some good ones, but very few great ones. Maybe they've been overshadowed by some great corner backs or defensive ends, but either way, Michigan fans can expect a pretty standard unit this year. They'll be faster, stronger...maybe a tad smarter in the new system, but they'll still be the typical tough hard-nosed LBs that people expect. Ctrl A then you can see the date. Can't wait to see what teh Defense can do.